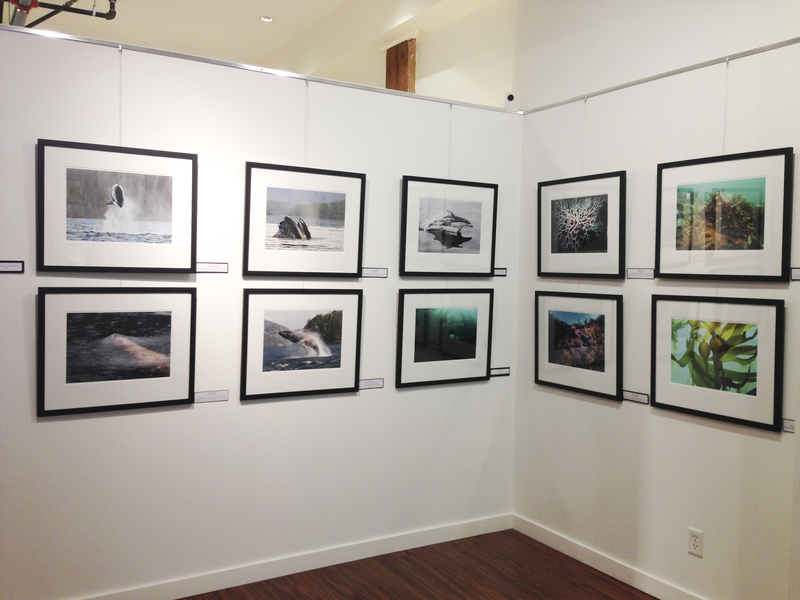 From the depths . . . .
“The Marine Detective” art show at 546 Yates in Victoria. Includes a 15 min rotating slide show of images. Come in, sit down, and disappear into the depths for a little while? It is the morning after the opening of my first art show and I am awash with a sense of gratitude and community. As I strived to express last night in my presentation, had anyone told me way-back-when that I would ever have an art show, it would have been the equivalent of being told that I would undertake interplanetary travel. An art show?! It was very high threshold for me because, rather than just striving to capture the mystery, beauty and fragility of the Ocean to inspire and educate, the images are being put forward as ART. Therefore, last night was very much for me another “How did I get here?” experience. But I do know the answer. It is because, however the magic of life works, I have been allowed to fully, deeply understand the importance of the Ocean as the life-sustaining force on the planet. And, as a teacher, enhancing the potential for our children to have healthy, happy futures will always be what gives my life direction. 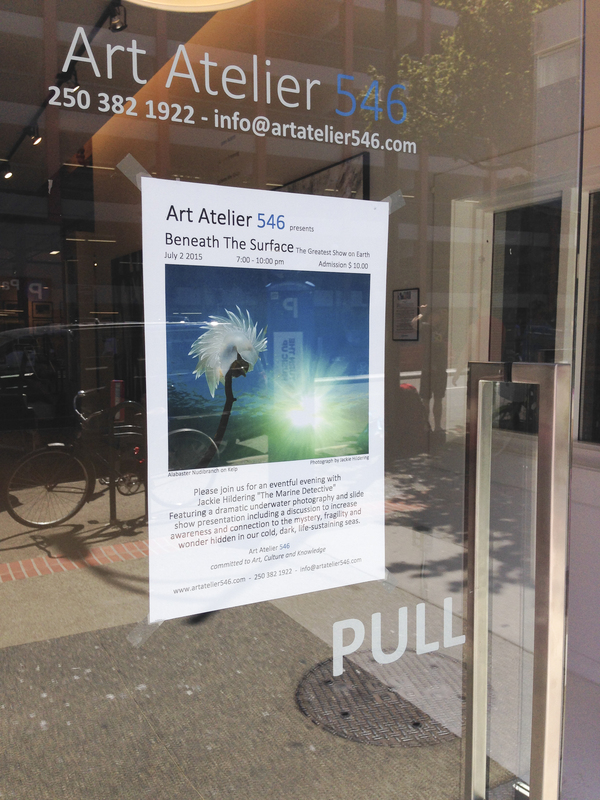 “The Marine Detective” images at Art Atelier 546 in Victoria (on 546 Yates Street). Click to enlarge. How did I get here? It has to do with geography, opportunity, difficult and daring decisions made, skills, experience and . . . you. Please hear me. It has to do with YOU. Wherever this is going – wherever it has gone – it is because of a force of people who share the values and objectives of “The Marine Detective” and want it to move forward. The sense of gratitude I am overcome with this morning, and that is so difficult to express, is that I feel I am being held up by an Ocean of people . . . . those who were at the opening last night; the whispers and shouts of support and encouragement on social media; the sharing to expand the reach of the content there; the applause expressed in so many ways; the enablement of diving, photography and whale research; the sharing of calendars and prints into the world so that they might further connect others; the assistance re. potential books, webisodes, whatever . . . it’s you. I know that The Marine Detective is a community working for greater understanding and positive action for socio-environmental good. From the depths, thank you. Because of you I speak louder; I dare more; I keep at it and, I stay afloat . . . gently propelled to who-knows-where. Link to photos – here. Photo by Andrew Topham, made possible with Melanie Wood. And They Spread Their Giant Wing-Like Fins . . . Your work looks beautiful on the walls and your talk was articulate, funny, and inspirational. Good job Marine Detective. oh and you looked fabulous too!!!! Mutual adoration dear “an adoring fan”. So appreciate your presence at the show’s opening. Yay Jackie! So happy for you! Keep creating and sharing with us what you do. It is such an amazing glimpse into the life of the ocean. Thank you so much for that! I so very much appreciate the feedback Bridget AND the encouragement. Thank so Fiona. It is a realization that has been pushing itself to the forefront: referencing these as environmental problems feed the idea that this is something outside ourselves rather than this is all about our health and happiness = social problems. Congratulations, Jackie! Yes, you are a true artist because you communicate to others (in whatever medium it takes) from your heart. More power to you!! So appreciate the feedback Jerry. Thank you! Thank you so very much Sarama. Congratulations, Jackie! We knew it would be a success for you and most of all the marine environment. Love the above photo of you in your happy place…no tutu, or is it beneath the waves? I am humbled to think that I, as one of your adoring “fans” has in some way helped you to tell the important story of our Ocean! I love being part of your crew and I will sail these seas of ocean stewardship with you for always! Congrats on your first (of many) art shows! I wish I could get down to Victoria to see it in person! Feel such kindred intent with you Christy and SO appreciate the support and faith in it all. Huge hug to you Cindster. So appreciate the feedback Wendy but if ever there were not a dullard . . . ! So deeply appreciate this feedback. Congratulations, Jackie! I’ll try to get to Victoria to see the show. Jackie, are any of your prints for sale? Hello Abby, Thank you so very much for asking. Yes, they are all for sale. The Art Gallery has 20 x 24s for sale as well as unframed 7 x 10s.